A week ago Liza and I had the opportunity to check out Hannah Moscovitch's new piece at the Theatre Centre. Staring Maev Beaty - The Secret Life of a Mother is awonderfully tender and raw look at motherhood. Delivered in 5 acts Ms. Beaty gives a harrowing and hilarious performance. She is quite literally a force of nature and watching her on stage is such a gift. Would love to see 15 minutes more added to this piece which is such intetesting feedback and so rare. In 2013, long-time friends, Hannah Moscovitch (Bunny / Stratford Festival) and Maev Beaty (Mouthpiece / feature film) began work on a project about motherhood. What started as an exploration of mothers took a very personal turn when both women became mothers themselves. Suddenly, they were experiencing what they were writing about; an investigation became a confessional. 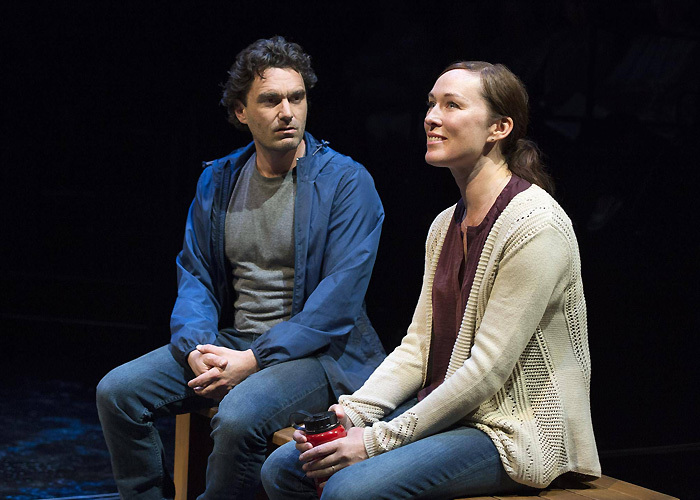 Written by one of Canada’s most prolific and popular playwrights, Secret Life of a Mother, developed in Residency at The Theatre Centre, is an exposé of modern motherhood and Hannah Moscovitch’s most personal writing to date. One of her oldest friends, the multiple Dora Award-winning actor Maev Beaty, tells this story, and through it her own motherhood secrets start to surface. There are times throughout the theatre year that pieces come along that remind you of the power of live theatre. The capacity it has to transform, to resonate, to somatically impact. NOW YOU SEE HER is that show. A profound, visceral and exquisite piece of theatre. So far our favourite of the year. Do yourself a favour and see Her. Nightwood Theatre, Quote Unquote Collective and Why Not Theatre are immensely proud to co-produce the World Premiere of Now You See Her. With a track record of successful collaboration, from supporting the first iteration of Quote Unquote’s Mouthpiece in the RISER Project in 2015, to its production in Nightwood Theatre’s 2016/17 and 2017/18 mainstage seasons, the relationship has been a fruitful one. Now, fresh from premiering the critically acclaimed adaptation of MOUTHPIECE as the Special Presentations Opening Night film at the 2018 Toronto International Film Festival, Dora Award-winning artists Amy Nostbakken and Norah Sadava (Artists to Watch in Fall 2018 – NOW Magazine) have joined forces with Lisa Karen Cox, Maggie Huculak, Raha Javanfar, and Cheyenne Scott to create this incendiary new piece of theatre. Tickets are available in person at the Buddies in Bad Times Theatre box office (12 Alexander Street), at 416-975-8555, or at buddiesinbadtimes.com. The 2018-2019 Factory season begins with the return of Dora Award-winning playwright Anosh Irani (Bombay Black) to Factory, and the Toronto premiere of his latest play, THE MEN IN WHITE, directed by Philip Akin.